Rosewater? Yes. 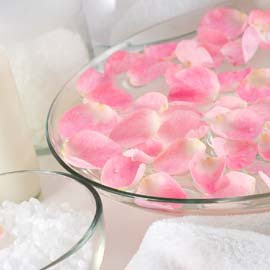 Rosewater is a Beauty Tips Must Have. Not only does it have a beautiful scent but it can hydrate naturally. According to Cheap Chica this not only hydrates but acts as a moisture element when applying makeup. "And no, it won’t mess up your makeup. Not only does rose water set (some might say fix) your makeup, it keeps your skin hydrated without having to apply any sort of cream." I am always looking for great "natural products" for my skincare. I have experimenting with various things but this is surely one that I am eager to try. Something that can act as a toner and hydrator is #1 on my list. Below are some affordable options, if you wanting to try this beauty tip. I've heard this a bunch too, and I've been meaning to try it. I have some rose-extract lip balm, and it's by far the best lip balm I've ever tried. I'm sure the rosewater is impressive as well, and something that "sets" your makeup would be mighty handy in the upcoming summer months!